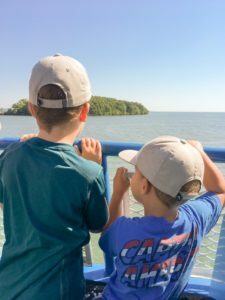 A highlight each summer is our trip to South Bass Island, Ohio. Every time we take the short drive up to Lake Erie, I am in awe of the fact that this beautiful place is in Ohio. We live surrounded by beautiful cornfields and far from the ocean – and the fact that in just a few short hours we can be on a boat surrounded by water is just amazing to me. 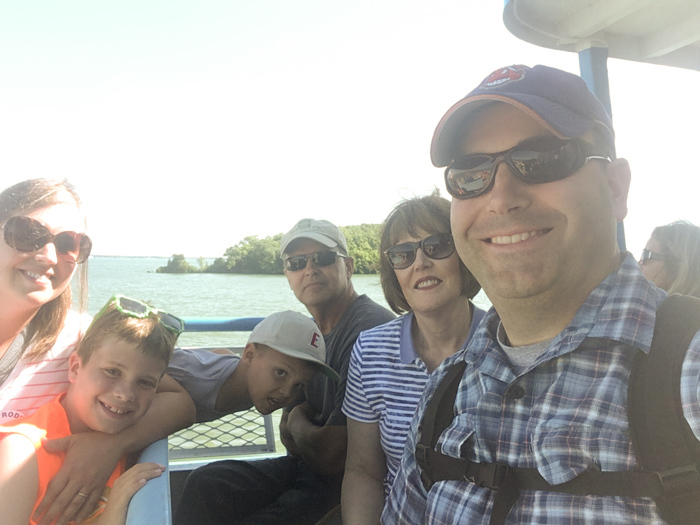 This year my husband took a day off of work and my parents joined us as we ventured across Lake Erie to South Bass Island where the little town of Put-in-Bay is located. And of course, we took the Miller Ferry across. In just a little over 20 minutes we were walking up the hill to grab our golf cart and off we went for a full day of exploring. 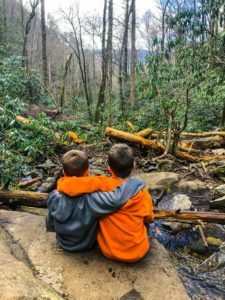 This year we stopped at new places and I wanted to share the highlights so that when you visit, you’ll also find these sweet spots to enjoy with family. 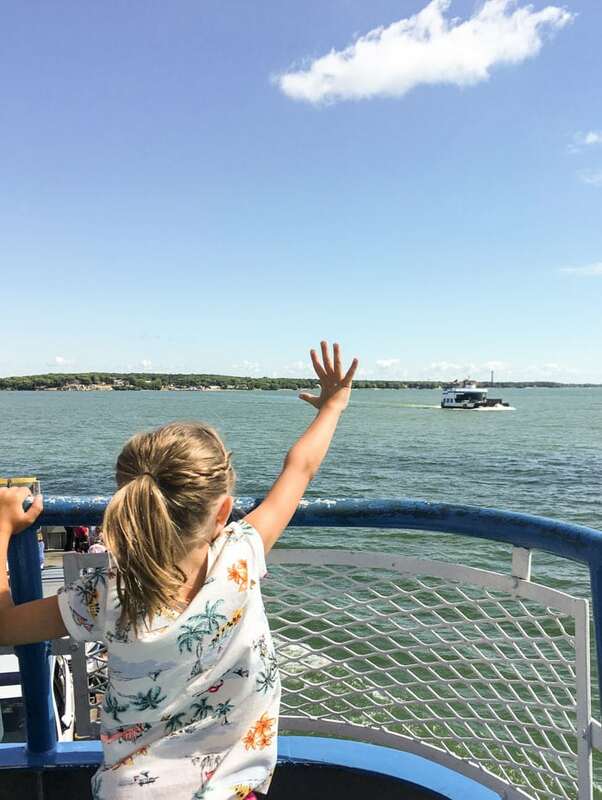 The Miller Ferry – Always a highlight is just taking the boat to the island. The water was calm and the sun was out the day we ventured to South Bass Island. If you have a car, motorcycle or bike, you can also take the ferry across. And like my mom says, as you travel over the water, your blood pressure goes down. I have to agree! 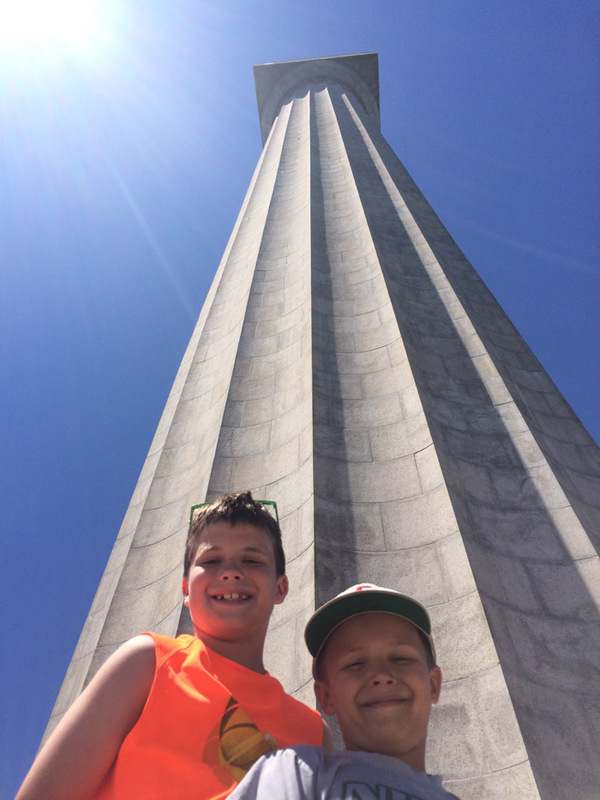 Perry’s Monument – Last year we visited the museum, but this year since it is now open from renovation, we went to the top. Perry’s Monument according to our guide is 10 feet taller than the Statue of Liberty. And the views on the day we were there were spectacular! You could see the entire South Bass Island along with other islands and Canada! I really appreciate the fact that at every corner of the top, they had a map so you could locate different landmarks. 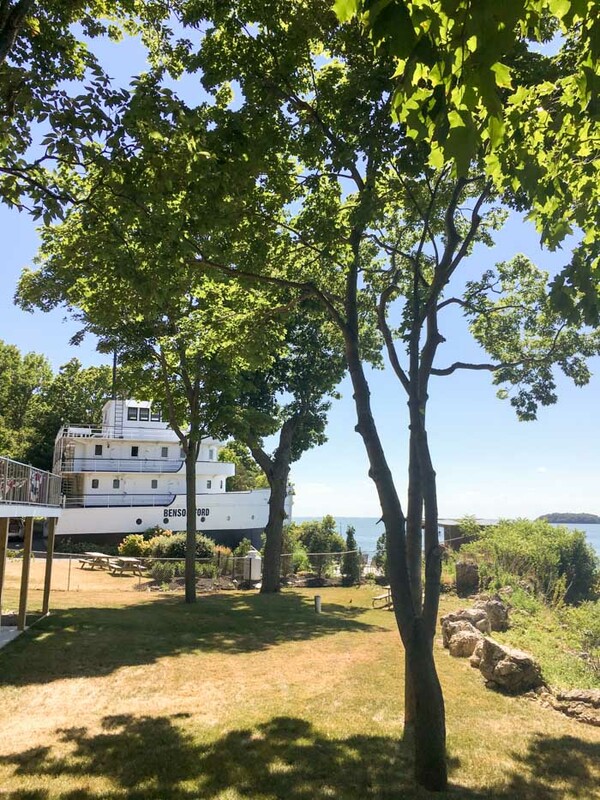 The Boat House – My mom grew up going to South Bass Island every summer and spent a week there with friends and family. She would tell us about a house that was really a boat. We found it on this trip and enjoyed the little park that you could visit to look at the boat house. Aquatic Visitor Center – Last year we found this little gem, but it was closed since we visited on a Tuesday. 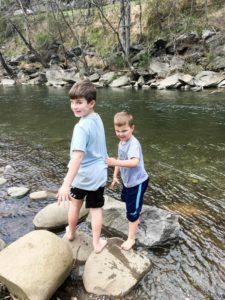 This year, we intentionally planned to visit on a Wednesday to fish with the kids. I’m pretty sure my boys would have stayed all day at the dock. While it is no longer a hatchery, you can tour the museum. Fishing poles and worms are provided for kids to take their chance at catching something. And although my boys did not, we saw a few kids that did! 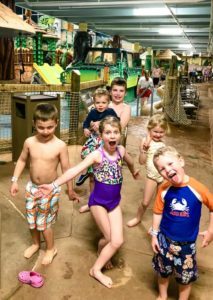 Such a great spot to bring the kids! E’s Golf Carts – As part of our visit we were provided a golf cart from E’s Carts. 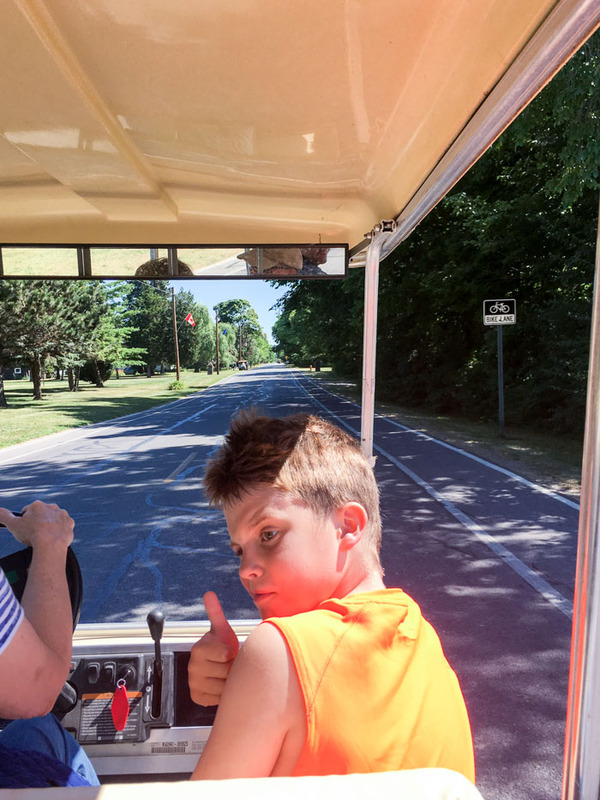 Up the hill from the Miller Ferry and to the right is where you go to grab a golf cart to explore the island. I do recommend making a reservation as we jumped straight to the front with a reservation versus those who had to wait in a separate line to get their golf cart. 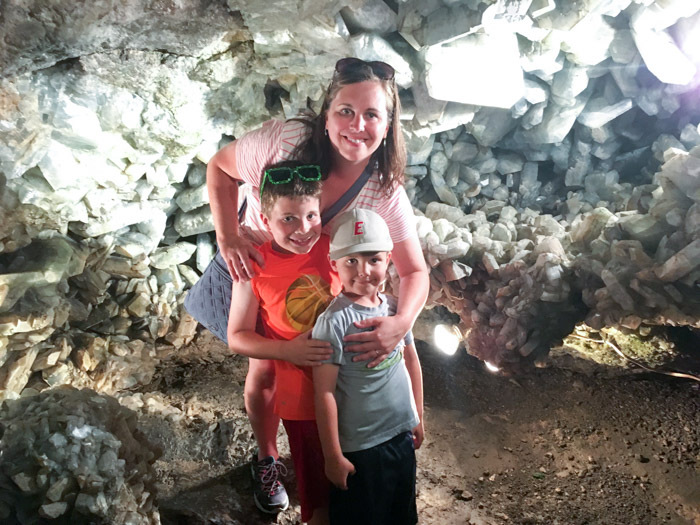 Crystal Cave – This year we decided to visit Heineman’s winery and explore Crystal Cave. It was much smaller than I anticipated but we did get to stand in the largest geode in the world. 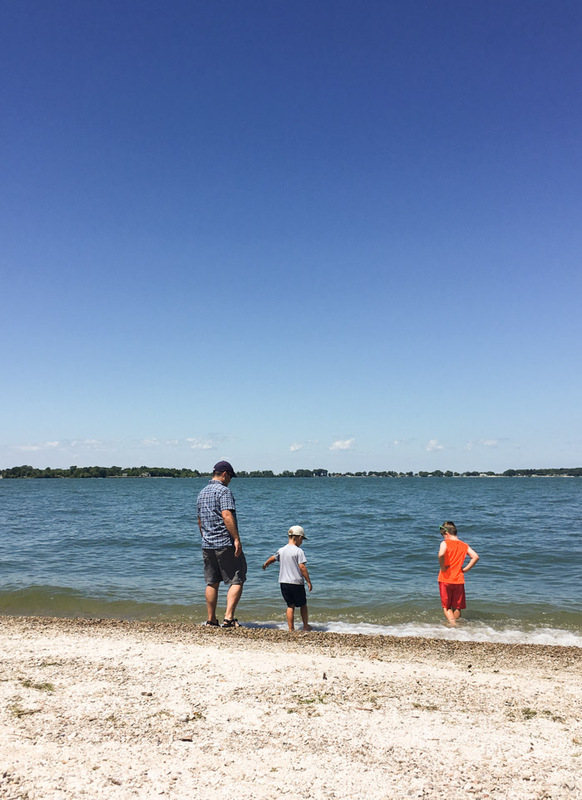 South Bass Island State Park – We end our day every year in the water. 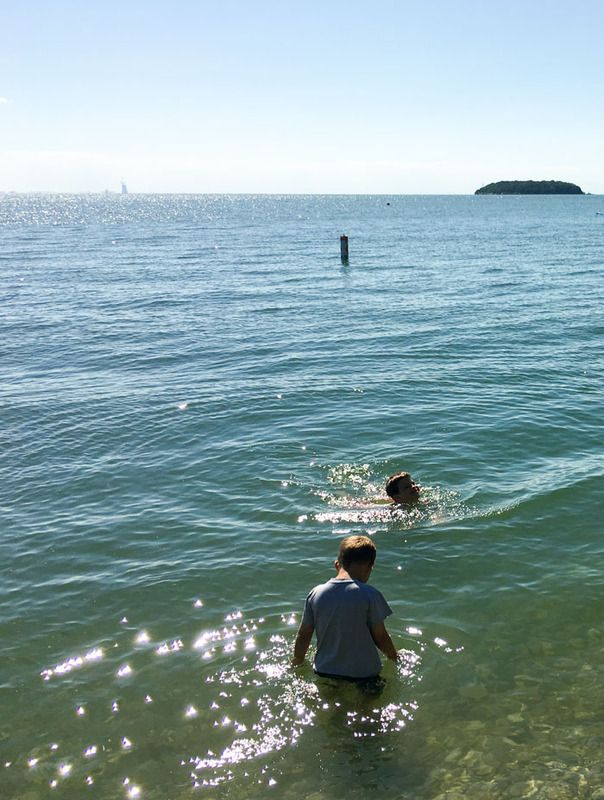 We pack an extra set of clothes for the kids and they jump right in to the clear Lake Erie water. In addition to traveling around the island we enjoyed The Goat Soup and Whisky Tavern for lunch. Their fish tacos are delicious. 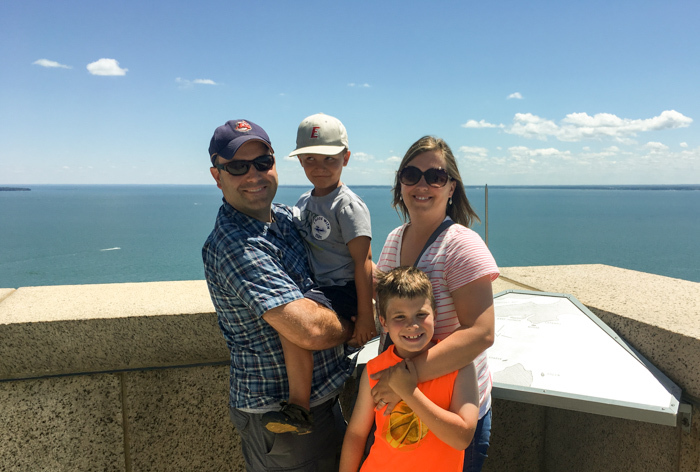 We also enjoyed the park near the downtown Put-In-Bay area as well as just driving around and exploring. 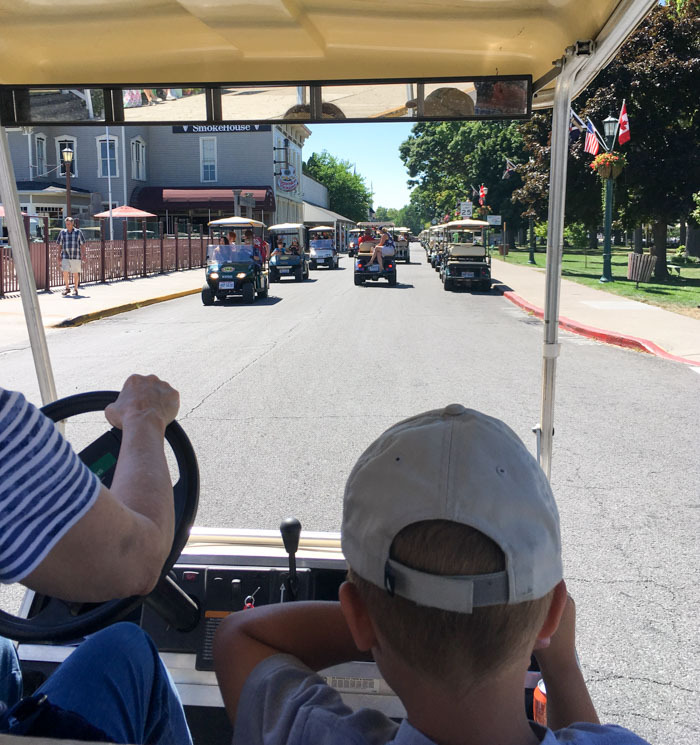 Put-In-Bay is a great place to visit this summer! 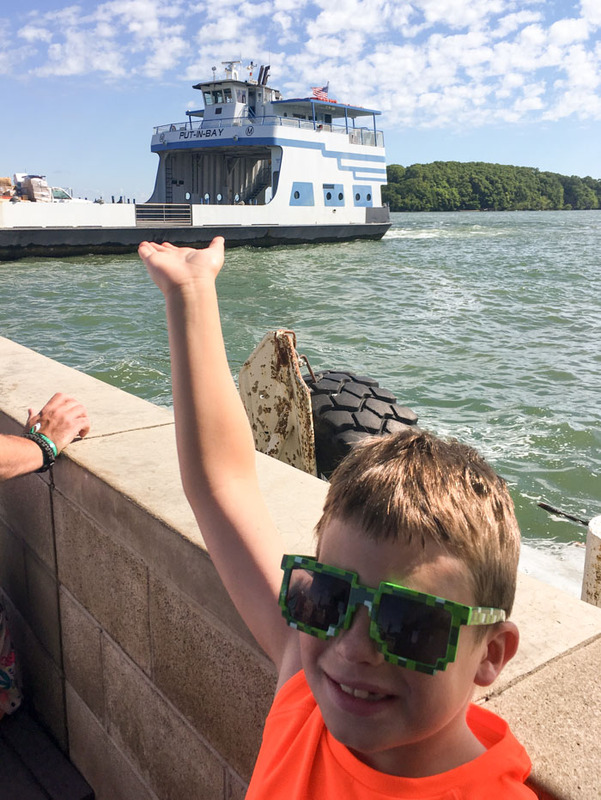 Leave the stress of everyday life behind as you take the Miller Ferry to Put-In-Bay! I honestly can’t wait until we go back. There’s something to be said about feeling like you’re miles and miles away when you’re only a few short hours drive from Central Ohio. 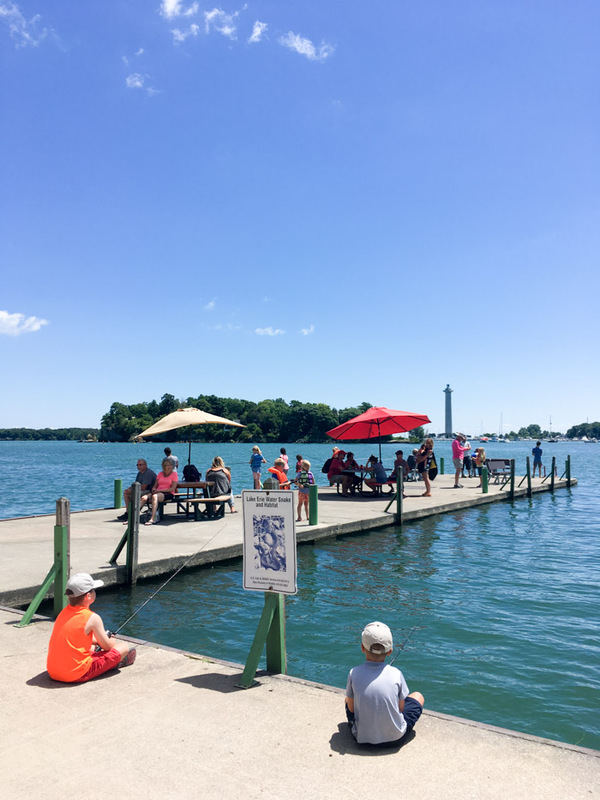 What’s your favorite thing to do near Lake Erie? I was hosted by Miller Boatline. 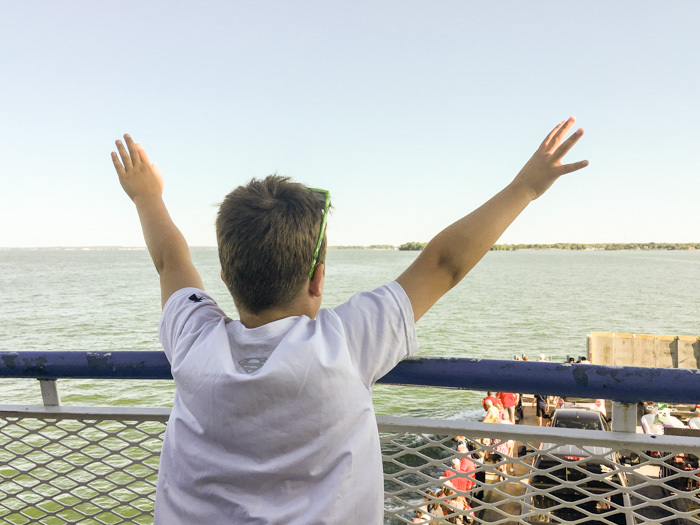 You can follow Miller Ferry on Facebook, Twitter and Instagram. All opinions are my own.